The Newport 462-XYZ ULTRAlign series is Newports best linear stage, with Stainless Steel construction, ultra-smooth translation, and the ability to carry loads. Both the 461 and 462 series of ULTRAlign stages utilize crossed-roller bearings. 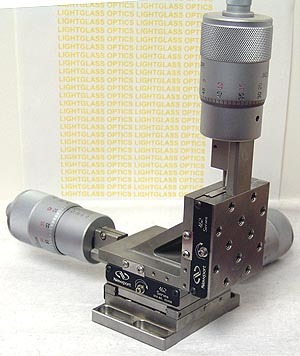 This stage is equipped with Newport HR-1 Long Travel, High Resolution micrometers, made for Newport by Starrett. The HR-1 micrometer has 25mm of travel, yet offers .2 micro-meters of resolution. Newport chose Stainless steel because of its stability across a wide variety of temperatures. The mounting base can be removed to lower the stage profile.